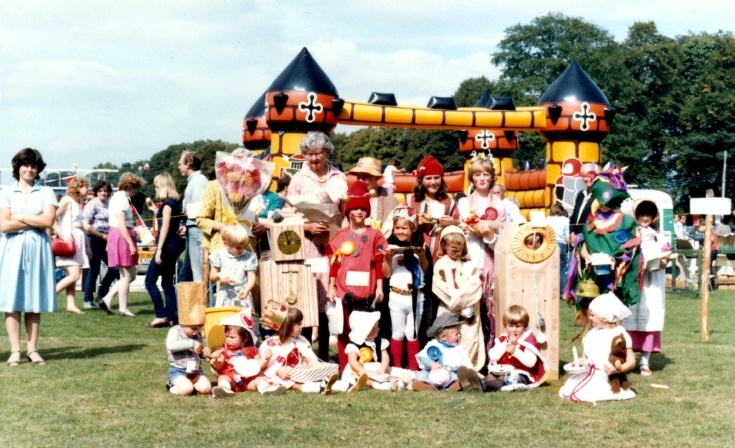 This the final picture of the Handcross Fete of 1984 held in the Recreation Ground. Obviously there is a fancy dress competition taking place and perhaps Miss Hilary Preston from Slaugham Park is judging the event as she is holding a quantity of papers and a cup of tea! On the extreme left is Tiffany Pearce in a blue dress. Please can anybody add more names? In the background is the West Lodge of Handcross Park which provided the clue to identify the location as the Recreation Ground. I think that is me in the back row with a red hat dressed as Wee Willie Winkie but I have no memory of it at all!